Following the battles at Lexington and Concord, the British soldiers returned to Boston, which was gradually being encircled by gathering Massachusetts militiamen. When word of the bloody encounters at Lexington and Concord reached England, the British government dispatched additional troops to reinforce the garrison at Boston. Those troops arrived in May 1775. On June 14, 1775, the Continental Congress, meeting in Philadelphia, voted to create the Continental Army, which included the Massachusetts militiamen encircling Boston. On June 16, American soldiers were sent onto the Charlestown Peninsula, north of Boston, to occupy Bunker Hill, but for reasons that are not entirely clear, they constructed their fortifications on neighboring Breed’s Hill. Rather than laying siege to the American forces on the peninsula by sealing off the neck, the British command opted for a frontal assault on Breed’s Hill on June 17, 1775. Following two failed assaults that resulted in heavy losses, the British overran the American fortification on a third attempt after reinforcements arrived and the Americans ran low on ammunition. After overrunning the fortifications on Breed’s Hill, the British inflicted heavy damages on the Americans as they fled the Charlestown Peninsula. The fighting on the Charlestown Peninsula resulted in 1,054 British casualties and 441 American casualties, most of them during the retreat. The battle is known as the Battle of Bunker Hill, despite the fact that the focus of the action was on the American fortifications on Breed’s Hill. The Battle of Bunker Hill was the first significantly large battle of the Revolutionary War. The Battle of Bunker Hill had little military impact on the war, as the result still left the British troops in Boston encircled by growing American forces. The Battle of Bunker Hill lasted about two hours. The Battle of Bunker Hill was witnessed by thousands of civilians from neighboring hills, rooftops and balconies in Boston. 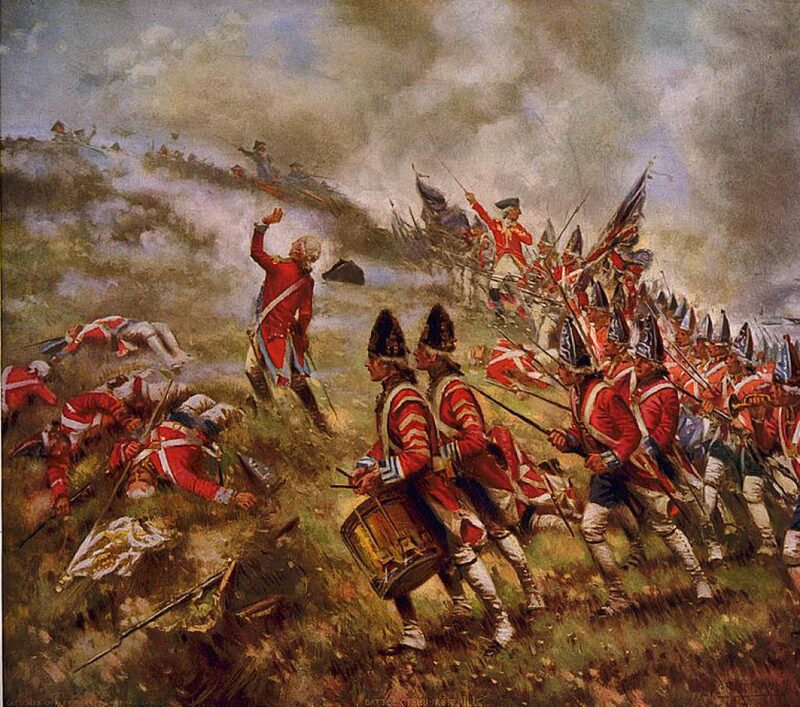 Although the British were victorious at Bunker Hill, the battle was a moral victory for Americans throughout the colonies, who now had real evidence that they could engage and inflict heavy casualties on the greatest military force in the world.